This is the first of four editions of the DIY Home Decor roundup. Today we are going to cover the first 7 of 28 of my very favourite DIY. I'm constantly looking for new projects to try, some are definitely better than others, everyone has seen Pinterest Fail jokes. I've gathered the best DIY Tutorials I've come across in the last few years to share with you. I hope you find all the inspiration that I did. I also want to thank the amazing bloggers who document and share with others their process, without them I would not have been as daring in my own home renovations. This DIY is actually broken up into several post. She has a post of her top 6 tips on painting a pattern wall, and the one about dealing with paint bleeding is epic. Problem solved. She also goes into what went wrong with this project, I especially like that because we often only see the the best bits. My favourite part is how she embraced her mistake and used it to be creative. Look at these doors! There is one thing I think when I see them and it's FABULOUS! ok, i don't normally go around saying things like "fabulous", but these are pretty awesome. I've seen a lot of flat panel door makeovers but this one is special. The pattern is unique but totally doable and the colour is super bold. 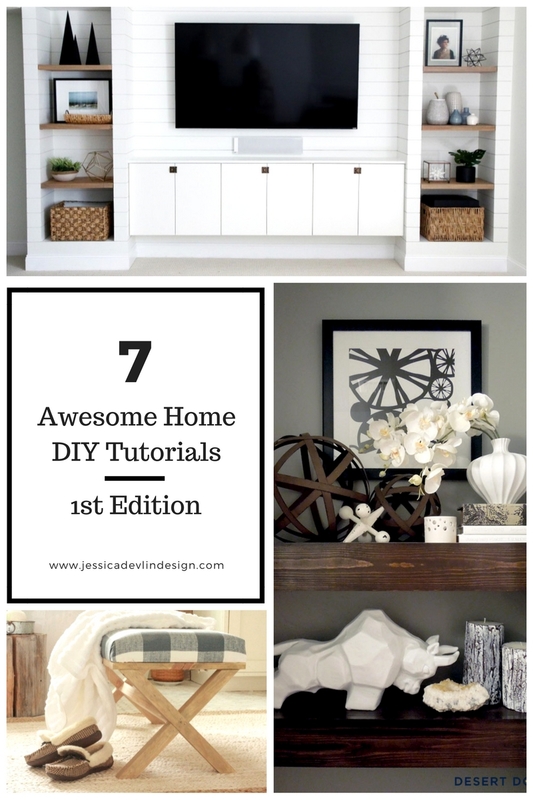 Love this blog for big DIY Home Decor Tutorials . They break down each step, talk about the planning process and go into what you'll need. This is a big project but they somehow make it seem doable. They even stained their own wood, paint matched the ikea cupboards, (yea the middle is ikea, brilliant). This tutorial is for the entire corner. She goes into how to install the tongue and groove panelling, how to build that shelf and how to make that reef! I've purchased that mirror in black from walmart incase your want that exact one, she painted it and then roughed it up a bit. I actually followed this tutorial and built these shelves! It was easy to follow with diagrams and step by step photos. this is a total if I can do it, you can do it moment. This was one of my very first DIY projects and I did it completely alone, from buying the material to cutting the wood. I did make one mistake, I chose to buy hardwood for the structural pieces, this was a rookie mistake. They were harder to work with, more expensive and did nothing to better the project. I never was able to style it as pretty as she does. She takes something that's complicated and breaks it down into easy steps. I particularly like how customizable this stool is with different stain or fabric it can look completely different. Cutting angles sometimes scares me but i'm sure i could do this and maybe ill make it my next project! Open shelves in the kitchen are a huge trend right now, but how can you make them sturdy enough to hold the weight of all your dishes? Bigger Than The Three of Us has us covered. They go into the hardware they used and the whole process. This was eye opening for me because I hadn't realized that there isn't tile where the shelves are, I assumed they completely tiled the wall and then added the shelves. This is a great resource for anyone wanting to add shelves. don't miss the next 7 tutorials!